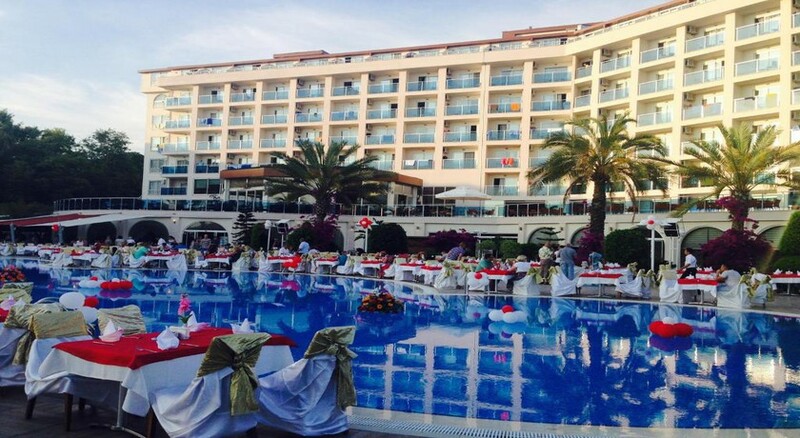 Annabella Diamond Hotel & Spa is a seafront property located in the beautiful city of Antalya, Turkey. The hotel features an outdoor swimming pool, private beach, aqua-park, fitness centre, spa, and many more luxuries. The aqua-park has three waterslides offering fun and excitement for the whole family. At the hotel’s main restaurant, delicious buffet meals can be enjoyed in a relaxing atmosphere. A snack-bar near the pool serves mouth-watering snacks such as pastries, ice-cream, salads and grilled dishes. 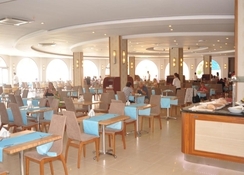 Guests can also dine at the a la carte restaurants inside the hotel. Many exciting activities are organised by the poolside. A professional team presents entertainment shows for the guests to enjoy. Sports activities include beach volleyball, table tennis, boccia, aqua gym and lots of other fun-filled activities. The hotel is located on the seafront area of promenade D-400 in the tourist centre of Incekum. The Antalya Airport is 100 km from the hotel and the Gazipasa Airport is 67 km away. 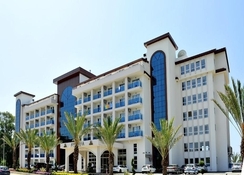 The hotel is 2 km from the Avsallar town and 20 km from the centre of Alanya District. The resort of Side is about 30 km away. Accommodation facility at the Annabella Diamond Hotel & Spa features a main building and an annex building. The main building has 222 standard rooms, 7 family rooms and one king suite. All rooms are elegantly designed, have laminate floor and are well-furnished with air-conditioning, bathroom/WC, minibar, LCD TV, hairdryer, telephone, and free wireless internet service. All rooms have a balcony offering fantastic views of the sea. The annex building is about 300 metres away from the hotel. It has its own reception and restaurant. There is an underpass between the two buildings. This annex building has about 95 standard rooms and 200 beds. All rooms are well-furnished with split air-conditioning, sitting area, laminate floors, electronic safety deposit box (local charge), telephone, hairdryer, bathroom/WC, minibar, LCD TV, and a balcony. The main restaurant in both the buildings serves breakfast, lunch, and dinner in an open buffet style. 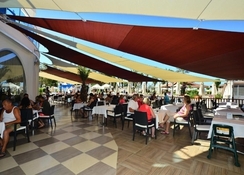 A snack restaurant near the pool serves many light snacks such as pastries (different kinds of Pie and Gözleme), ice-cream, salads, and grilled dishes. Guests can dine a la carte as well. The lobby bar serves a wide range of alcoholic and non-alcoholic drinks throughout the day. A pool side bar also serves refreshing snacks and drinks. The hotel offers a large outdoor swimming pool with Aqua Park featuring 3 waterslides. Various activities are arranged beside the pool during the day. Sports and leisure activities include fitness centre, beach volleyball, darts, table tennis, boccia, aqua gym, and many of fitness related activities. For an additional charge, the guests can enjoy massages, sauna, and a Turkish bath at the hotel’s Spa and Wellness centre. A seasonal indoor heated pool is also available. Also, there is a private water sports team on the beach. Guests can play tennis in the tennis courts situated near the hotel. The guests can visit many restaurants and shops located near the hotel.